SEQUOIA NATIONAL PARK, Calif. November 14, 2018 - The Eden Fire continues to grow and is now 343 acres as mapped via the parks’ helicopter. Fire has slowed its progress in the Eden Creek drainage on the western edge of the fire. Fire however has established itself on the east side of the eastern branch of Eden Creek drainage. One spot fire was observed on the east flank approximately 200 feet off the main fire and burning actively. Fire does not appear to be moving up-slope (south) towards Homers Nose. Continued positive fire behavior is occurring with consumption of brush and downed logs. Some standing dead trees, called snags, may have been the source of some spotting. Numerous snags are present in the area from tree mortality and the lack of modern fire history. The parks will continue to monitor the fire via helicopter while scouting for natural barriers along the rocky ridge (Homer's Nose) to the south. Additionally the parks will actively track any new growth downhill toward the Kaweah drainage. Smoke is visible from the western side of Sequoia National Park. Most of it is coming from a trio of fires in Sequoia National Forest with some smoke contribution from the Eden Fire. Other smoke in the area is from the larger fires currently burning in California. For more information on non-NPS fires, visits www.inciweb.nwcg.gov or www.fire.ca.gov. Another thing to keep in mind is that in addition to the smoke from wildland fires, daily activities in the valley (vehicles, agricultural activities, industry) are also contributing to these particulates that are trapped in this region. It's an unfortunate meteorological condition during some extreme fire events that we're experiencing. All areas of Sequoia National Park remain open as previously scheduled. Additionally, there are no impacts to any of the normal operations in the Mineral King section of Sequoia National Park. 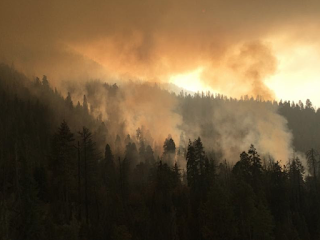 The Eden Fire continues to move with moderate to low intensity restoring fire to the Eden Creek Grove of giant sequoias. - NPS Photo.